Welcome home to this exquisite and spacious two bedroom, two bathroom home! This lovely home has an inviting entry foyer leading to a sizeable dining area. The adjacent huge windowed eat-in-kitchen is every chef's dream with ample counter space, plenty of cabinet and storage spaces and a huge window. 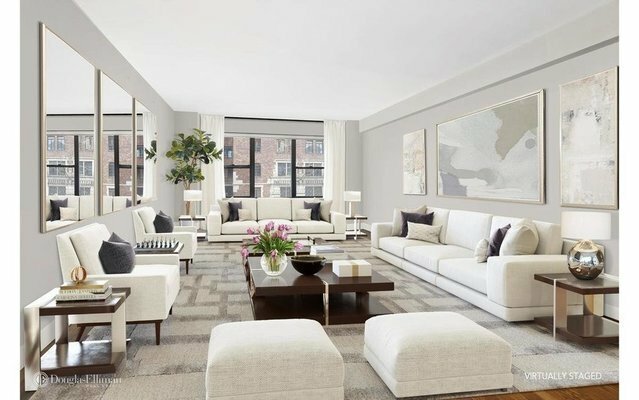 The large living room flanks the dining area and provides a wonderful entertaining space or a comfortable respite from the busy city with a beautiful view of the quiet cul-de-sac and a peek of the East River. There are two master sized bedrooms, the master has two exposure East and North, an ensuite windowed bathroom with a shower stall and great closets. The second bedroom is also very large with plenty of storage and is currently set up as a den/office.Enjoy this most wonderful tree-lined cul-de-sac in Manhattan at 2 Tudor City Place, a hidden urban sanctuary. Conveniently located near a private park, convenient transportation (Grand Central Station), fine and casual dining options and wonderful shopping venues. 2 Tudor City place is a well-served cooperative with 24 hour doormen, a garden, gym (fee), and storage (waitlist fee). Maintenance includes electric. The building is pet friendly, allows pied a terres, co-purchasing and permits 70% financing.Call or email to see this stunning home today!